*I received this book for free from the Publisher (via YA Books Central) in exchange for an honest review. This does not affect my opinion of the book or the content of my review. Ray must figure out the meaning of life in order to be the beneficiary of his late grandmother’s will. At stake is the trailer park where he and his whole family live and work. 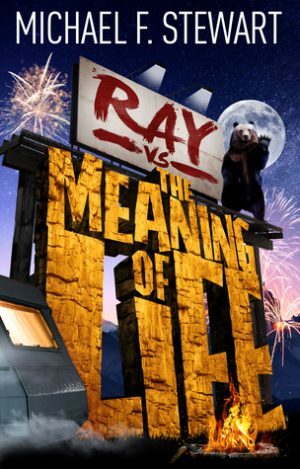 In the process of finding the meaning of life, Ray begins to experience life and change the way he lives it. The concept of this book is wonderful. A teenager must experience the world around him in order to earn a great reward. This concept intrigued me and I couldn’t wait to figure out what would happen with Ray and his family. The story started out both sad and odd. Ray’s grandmother is killed in a freak run-in with a grizzly bear. Then in a turn of events ,that reminds me of a Simpson’s episode, a surgical team arrives in a helicopter and freezes grandma’s brain. They then place her brain in a gigantic statue of grandma. Her brain then watches over the trailer park. At the beginning of the story Ray came off as a typical self-centered teenager. He plays video games and eats mac & cheese all day. As Ray becomes more sympathetic to those around him and realizes he had not been living life to the fullest, I really began to root for him. His support of his friend’s father and the little girl who only wanted to go swimming really brought out Ray’s good side. I thought the guru that helped Ray through with his search for meaning was, at times, a bit much. However, ensemble of characters with strong personalities, including Ray’s mom and sister Crystal, really made the story sparkle. Although the ending seemed like a let down at first, I later thought on it and found it to have some metaphorical meaning. The beginning and ending were a little weak for me but the central theme of the story and the great characters really stood out and made this a great read.